Over the last two weeks, it feels we’ve had ourselves two highly anticipated releases by two huge up and coming British rock bands. The first came just over one week ago in the form of Marmozets’ Knowing What You Know Now and the second came a week later in the form of Don Broco’s Technology. Technology is the third full length from the Bedford based Alt/Pop rock band and follows the hugely successful Automatic that was released in 2015, which saw them tour with the likes of Bring Me The Horizon and 5 Seconds of Summer during that album cycle. On a personal level, I wouldn’t really have considered myself a fan of the band leading up to the release of Technology as I always found there to be too much pop and not enough rock in the bands sound for me to get really on board; but regardless of that, it was impossible to ignore the hype around this album and its importance to one of the biggest up and coming bands in the British rock scene as they look to build on the success of their previous releases. 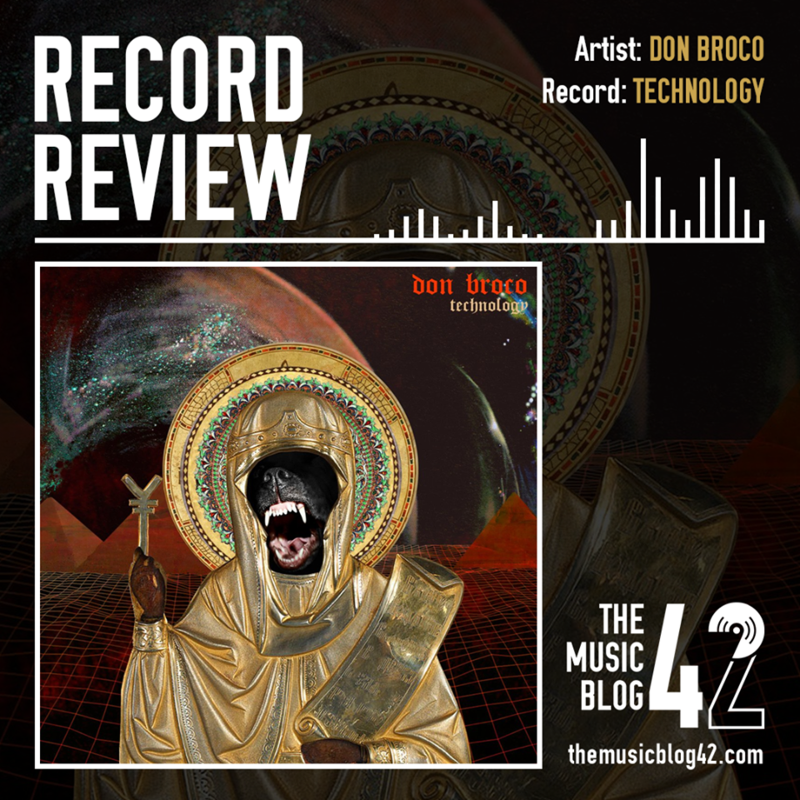 However, despite my previous feelings towards Don Broco being lukewarm at best, Technology has completely changed that, it’s a really solid album and really nice surprise from Broco. First up on the album is the title track as the band kick it all off with one hell of a main riff. That’s joined by a top vocal performance from Rob Damiani who’s personality and ability to make vocal hooks fun above everything else really shines through. Another standout feature on this track is the guitar tone and it’s a hulking, earthy and beautiful one at that, one that really makes the band sound huge once combined with the rhythm section who are also on top form here. All in all a really good opening track that I wasn’t expecting from Broco. Stay Ignorant is the second track and is a really fun one, as a funky bassline accompanied by electronic percussion makes up the verse, Damiani sings about sinking some beers and watching the match and how you’d be kidding yourself if you think you could live like that. A vocal that’s sure to stay in your head for a damn while. Then the chorus rolls around and the band let it fully explode into all its sing-along glory, follow that up with a superb breakdown riff right after and you have another top notch track. Up next we have T-Shirt Song which features a similar riffing style to Technology, another chorus with some top sing-along quality. On top of that, the guitar lead towards the end of the track is another standout moment on what is another quality track. This is followed by the lead single from the album, Come Out To L.A. and it is easily the standout moment on this record. The song takes what is an overused style of pop song with all the electronic instrumentation and chord progressions you may hear in a Chainsmokers song and give it a Broco-esque makeover and by the end of the song, it’s become something completely different entirely. At times it seems like the band are almost taking the piss out of this style of pop song and that only adds to the fun nature of the track. Shout Outs also go to the rhythm section on this song who pull of another excellent performance. Come Out To L.A. is a perfect example of pop rock done to the highest standard; the singalong factor is off the scale at this point. similarities, they each have their own identity and are top tracks in their own right. The groove to the chorus in Everybody, the pause and reintroduction of the chorus in Pretty and dynamic brought to the verses by the spacey guitar lines on Tightrope are standout moments. The second half of the album, however, is where the quality starts to drop. The band throw another 8 songs are way, songs that consist of the same ideas we’ve listened to on the first half of the album but this time they’re a whole lot more boring. This makes for a bit of a lul to the middle of the album and quite frankly Porkies, Got to Be You, ¥ and Something To Drink are all songs this album could do without. That being said Greatness, Good Listener, Blood in the Water and Potty Mouth all are reminiscent of what made the first half of the album so good and the further two give the album the send-off it deserves. When all is said and done though this album is a pleasant surprise for someone who was a sceptic of the band prior to Technology’s release. Top class riffing, sing-along choruses and the catchiest vocal hooks are in abundance here, however, the second half of the album really does stop a good album becoming a great one. Despite that, I’ll definitely be keeping an eye on what Don Broco do in the future. Best Tracks: Technology, Come Out To L.A.